Lucid Movies is a program that should provide you with a huge library of movies, which you should be able to stream online. It goes without saying, that having such application is ideal for most Internet users of today; especially at the time that video streaming has become so popular. Thus, it is not surprising at all that a rather large number of computer users already have this program up and running on their PC. What is unfortunate is the fact that most of the users are not aware of the fact that in reality Lucid Movies is yet another invasive adware program that just uses devious marketing techniques to lure users into obtaining a piece of software that will, in reality, only cause various disruptions while they are surfing the web. About such invasive activity, the user is not informed. If, unfortunately, you already have this adware up and running on your PC, do not waste your time and take appropriate measure to delete it once and for all since that is the only way to restore the default functionality of your web browser. 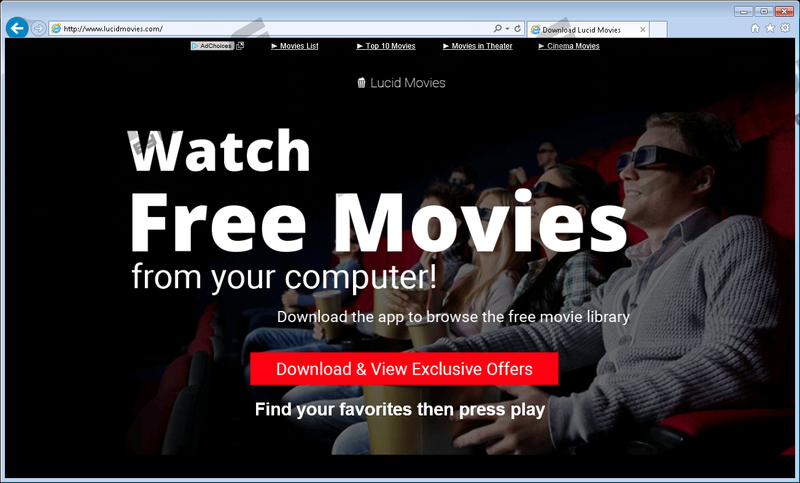 Lucid Movies starts functioning as soon as it enters your operating system. It is important to note that as a standalone application it does not perform in the way that it is promoted. While executing our research, we found out that in reality this adware does nothing to help you find your favorite movies online as well as it is not stable since random crashes occur rather often. It goes without saying that such functionality is one of the reasons we recommend a complete removal of this invasive application. In reality, the system service that starts with the launch of Lucid Movies is mostly used to interact with tons of adware servers. By being in constant contact with such servers, the adware applications can present you a vast amount of invasive ads, worthless coupons, and annoying pop-ups. Make sure to avoid all such content as it could turn out to be rather malicious. This is so because ads and pop-ups could be embedded with redirect links. This is a rather natural occurrence since adware servers are infamous for being associated with malware distribution. Thus, clicking on any of them is a risk that you should not take since you could end up on a questionable or even a potentially malicious website. Only a single click on such an advert could compromise your virtual security. Do not hesitate and delete this invasive ad-supported program once and for all. What is additionally alarming is the way that Lucid Movie is distributed over the Internet. While researching this adware we have found out that in the majority of cases it is spread via bundled installers. This is a dangerous instance, to put it mildly. The primary sources of such bundles are suspicious third-party websites. Make sure to avoid such sites at all times since it will significantly lower the risk of infecting your PC with this or any other dubious program. If, unfortunately, your PC is already infected with this adware and it happened this way, you must immediately check your system for other suspicious program since it is known that this ad-supported program almost never comes alone. The bundle content is almost impossible to determine since it depends on your geographical IP address, times of the download date, etc. Make sure to remove any additional programs that you did not install yourself as soon as possible since of them could even turn out to be malicious. Such distribution is another significant reason our research team urges you to stay away from Lucid Movies at all times. It goes without saying that its removal is imperative to your overall system security. A complete removal of Lucid Movies is imperative if you are a security conscious user. Do not rush through the removal procedure since a single mistake could result in a non-complete removal of this adware. This is a situation that you do not want to find yourself in since just a single leftover files or registry key could be used to silently restore the intrusive program. This is the main reason you must analyze your computer for potential leftovers associated with Lucid Movies right after you are done with the manual removal. If you find such analysis too complicated, your best bet is to scan your computer with a professional antimalware tool as it will detect anything associated with Lucid Movies automatically. Type Control Panel into the search box and select it. Select Lucid Movies and click Uninstall. Right-click Lucid Movies and select Remove. Quick & tested solution for Lucid Movies removal.